A suicide bomber in Pakistan killed at least 70 people and wounded more than 100 on Monday in an attack on mourners gathered at a hospital in Quetta, according to officials in the southwestern province of Baluchistan. The bomber struck as a crowd of mostly lawyers and journalists crammed into the emergency department to accompany the body of a prominent lawyer who had been shot and killed in the city earlier in the day, Faridullah, a reporter who was among the wounded, told Reuters. Abdul Rehman Miankhel, a senior official at the government-run Civil Hospital, where the explosion occurred, told reporters that at least 70 people had been killed, with more than 112 wounded, as the casualty toll spiked from initial estimates. "There are many wounded, so the death toll could rise," said Rehmat Saleh Baloch, the provincial health minister. Jamaat-ur-Ahrar, a faction of the Islamist militant Pakistani Taliban group, claimed responsibility for the attack in an email. It was not immediately clear if the group had carried out the bombing, as it is believed to have claimed responsibility for attacks in the past that it was not involved in. The motive behind the attack was unclear, but several lawyers have been targeted during a recent spate of killings in Quetta, the provincial capital of Baluchistan, which has a history of militant and separatist violence. The latest victim, Bilal Anwar Kasi, was shot and killed while on his way to the city's main court complex, senior police official Nadeem Shah told Reuters. He was the president of Baluchistan Bar Association. The subsequent suicide attack appeared to target his mourners, said Anwar ul Haq Kakar, a spokesman for the Baluchistan government. "It seems it was a pre-planned attack," he said. Aaron Driver, 23, was killed when police raided his home in the Canadian community of Strathroy, about 84 miles (135 km) northeast of Detroit in the United States or about 122 miles (197 km) southwest of Toronto. It was not immediately known how he was killed. "Earlier today, the RCMP received credible information of a potential terrorist threat," the Royal Canadian Mounted Police said in a press statement. "A suspect was identified and the proper course of action has been taken to ensure that there is no danger to the public's safety." The RCMP declined to provide further information, but CTV News cited an internal government memo as saying that Driver was allegedly planning to carry out a suicide bombing in a public area of a major Canadian city, possibly during rush hour on Wednesday to cause mass casualties. It was not immediately known which city may have been the target, but Canadian officials emphasized that there was no longer a threat, suggesting that the suspect may have been a so-called lone wolf. Further details are expected to be released later on Wednesday. DEVELOPING: Police in Switzerland say a Swiss man set a fire and stabbed people on a train in the country's northeast, wounding six people as well as himself. Police in St. Gallen say the incident happened at 2:20 local time Saturday afternoon as the train neared the station in Salez, near the border with Liechtenstein. They say the 27-year-old suspect had at least one knife and poured out a flammable liquid, which caught fire. Police say the wounded included a 6-year-old child, three women aged 17, 34 and 43, and two men aged 17 and 50. Some of the injuries were said to be serious but there were no further details immediately on the seriousness of their injuries. Two big car bombs have hit police stations in separate cities in Turkey, killing six people and wounding at least 219 others. The first attack targeted a police station in the eastern city of Van, killing one police officer and two civilians. Some 73 people were hurt. Hours later, a police station in Elazig was hit, killing at least three police officers and wounding 146 people. Turkish officials blamed the Kurdish militant group, the PKK. The PKK has carried a series of bombings targeting the police in the largely Kurdish south-east since a ceasefire with the government broke down last year. AT least eight people have been killed in a ‘ISIS suicide bomb’ blast at a wedding in south east Turkey. The terrorist attack in the city of Gaziantep, which is located 40 miles from the Syrian border, has reportedly left another 30 injured. The link above is updated and added many photos. AP just now updated and increased the total killed to 30. Farooqui was arrested Saturday by Roanoke County Police on charges of assault with malicious wounding, and he is being held without bond at the Western Virginia Regional Jail, according to the sources and a jail database. On Saturday, Farooqui allegedly injured a man and woman at an apartment complex in Roanoke, yelling "Allahu akbar" -- God is great -- as he attacked them with a knife, sources told ABC News. Authorities believe he may have been trying to behead the male victim, who was likely picked at random, ABC News was told. But on Tuesday -- after news of the case surfaced nationwide -- a spokeswoman for the Roanoke County Police said that while the male victim was cut "all over his body, including his neck," police do not believe the case looks like a beheading attempt. Asked whether Farooqui may be suffering from mental illness, the spokeswoman declined to comment. "The FBI is working with the police department following the incident that occurred on Saturday evening," Adam Lee, the head of the FBI's Richmond field office and the special agent in charge, said in a statement. "While I cannot discuss details of the investigation at this time, I do want to reassure the community that we are working to determine the nature of the incident." ISIS has released several propaganda videos showing the beheadings of Western journalists and others. It was not clear whether Farooqui has a lawyer. (CNN) A security guard was killed and 21 students were injured Wednesday during an attack on American University of Afghanistan in Kabul, said the head of Kabul Hospitals. The attackers detonated explosives and fired guns when they invaded the campus, witnesses said, causing some students and faculty to flee. Others hid inside buildings while the insurgents remained on campus, a senior State Department official told CNN. A police operation was set to search for the attackers, said Interior Ministry spokesman Siddiq Siddiqui. As of early Thursday morning local time, there was no confirmation the security forces had gone onto the campus. An attack with an explosives-laden truck on a police checkpoint in south-east Turkey has killed at least 11 police officers and wounded 78 other people. The state-run Anadolu Agency reported that Kurdish militants were responsible for the attack an a checkpoint about 50 meters from a police station near the town of Cizre, in the maily-Kurdish privince that borders Syria. Islamic State has claimed a suicide bombing that killed at least 15 people and injured 16 at a wedding party near the holy Shi'ite city of Kerbala late on Sunday. Five assailants including the suicide bomber attacked the celebration in Ain al-Tamr, west of Kerbala in southern Iraq, firing machine guns and throwing hand grenades, the police said. All the attackers were killed by security forces. The bombing is the first in the Kerbala region since Iraqi forces dislodged Islamic State militants from their stronghold in Falluja, 80 km (50 miles) north of city. A young policewoman, born in 1995, was savagely attacked with a knife early Tuesday afternoon at 2 PM in a Toulouse police station by a Muslim who tried to cut her throat. The Muslim carefully premeditated his attack: armed with a knife, he entered the Rempart Saint-Etienne police precinct claiming he wanted to file a complaint. He spotted the weaker and easiest person to reach, the young policewoman, and jumped on her. He tried to disarm her, failed, then pulled his knife and cut her throat. Hopefully, officers jumped on him and neutralizing him, which saved the life of the victim. Saw this in the news this morning, but it was too early to determine what exploded. It's like the world has become numb to these terrorist attacks. When searching just now on twitter, there was a single tweet: Doesn't anyone care about the attack in the Philippines? Sad. After looking at photos, I tend to believe IT WAS Abu Sayyaf (Islamist militant group) and not drug related. At least 14 people have been killed in a bomb attack in the home city of Philippine President Rodrigo Duterte. 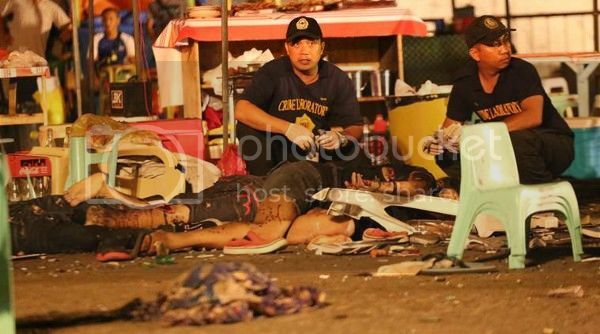 Dozens more were wounded in the explosion at a packed market in the southern city of Davao. A presidential spokesman said investigators had found shrapnel from a mortar-based improvised explosive device (IED) at the scene. Police in the capital Manila are on high alert following the deadly blast. At least 60 people were injured and 30 were taken to hospital. he explosion took place outside the Marco Polo hotel in an area frequently visited by Mr Duterte, who was in Davao at the time but was not hurt. Pictures released show broken glass and plastic chairs scattered at the scene, which has since been cordoned off by police bomb experts and investigators. A spokesman for the militant group Abu Sayyaf has claimed responsibility for the attack, but the president said authorities are considering the possibility that drug syndicates were behind it. Gas tanks and documents in Arabic were found in an unmarked car next to Notre Dame cathedral sparking fresh terror fears and at least two arrests, according to French reports on Wednesday. An anti-terror investigation has been launched following the discovery of the suspicious vehicle containing up to seven cylinders on Sunday yards from the cathedral - one of Paris's most visited landmarks where thousands of tourists congregate every day. Documents in Arabic were reportedly found inside and were "in the process of being translated". Four people suspected of being "radical Islamists" have been detained in a terrorist investigation stemming from the discovery of a car parked next to Paris' Notre Dame Cathedral with six gas canisters inside. The Paris prosecutor's office said Thursday that police arrested a couple -- a 27-year-old man and a 26-year-old woman -- a day earlier in the Loiret region of France, south of Paris. A second couple -- a 34-year-old man and a 29-year-old woman -- was detained in the same case on Tuesday. The two men, who are brothers, and the two women were transferred to Paris to be questioned by investigators trained in counterterrorism. 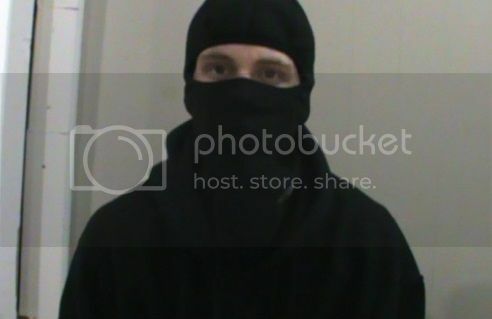 The prosecutor's office said all four are suspected of links to "radical Islamism". A policeman suffers stab wounds as three women are detained over gas canisters found in a car close to Notre Dame cathedral. 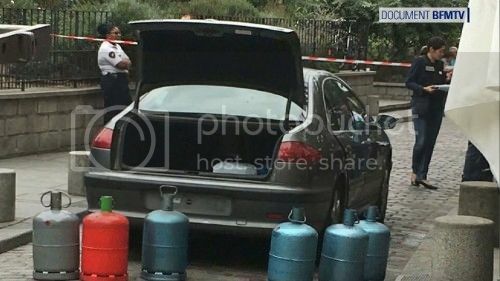 A woman was shot as she was arrested by French police investigating a car found packed with gas cylinders near Notre Dame cathedral. She is said to have been wounded when a police officer opened fire after the suspect stabbed another officer during the arrest. His injuries are said to not be life-threatening. The woman was detained in Boussy-Saint-Antoine on the outskirts of Paris, and is said to be one of the daughters of the owner of the vehicle. Two other women have also been held in the anti-terror operation. The French Interior Minister said all three were likely to be planning an "imminent violent attack". The car owner had been taken into custody earlier this week but was later released. He had gone to police on Sunday to report that his daughter had disappeared with his car. His daughter is known to police for wanting to leave for Syria, officials said. Four other people suspected of being "radical Islamists" have also been arrested in the same case. I'm not buying the "emotionally disturbed and not a terrorist threat" .. The meat cleaver maniac who hacked an off-duty cop is a Palestinian busted two months ago while screaming in Arabic outside a Brooklyn synagogue. Suspect Akram Joudeh was only in New York for Thursday’s Midtown rampage because he was appealing a deportation notice — with a hearing set for Oct. 14, a high-ranking NYPD source told the Daily News. Cops found two knives inside Joudeh’s car after answering the July report of an erratic man on Shore Parkway in Brooklyn shout “Allahu Akbar!” — or “God is great” in Arabic. But the source said investigations by the NYPD and FBI showed Joudeh, 32, was emotionally disturbed and not a terrorist threat. Joudeh was selling perfume out of his illegally parked car Thursday near Madison Square Garden when he attacked NYPD Detective Brian O’Donnell on a W. 32nd St. sidewalk, cops said. 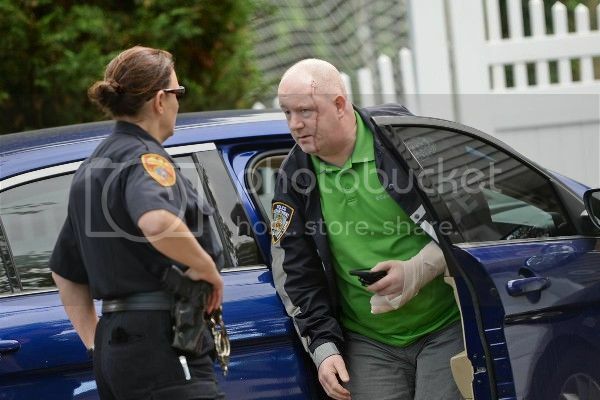 The 16-year police veteran left a Manhattan hospital Friday sporting a blue NYPD windbreaker and a raw red gash on his cheek. Cops shot the suspect six times after Joudeh ignored repeated calls to drop the cleaver, police said. 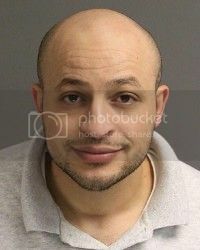 Joudeh, a career criminal who was likely living in his nearby parked car, went berserk when two police officers approached the vehicle — and went after the pair with the cleaver, police said. A 45-second video obtained by WNBC-TV showed Joudeh in the minutes before he opened a 6-inch gash on the jaw of O’Donnell less than a block from Penn Station.